1. There are a variety of document format tabs that can be visible from the Document View. All documents will have at a minimum, the Abstract/Details tab. Full text: displays the abstract and HTML full text. There will likely also be an option to translate the full text from English to any of the 14 languages currently supported. Your ProQuest administrator may have also turned on the text-to-speech reader. When you click play, the text will be read aloud in English. Full text - PDF: displays the PDF version of the document. You can additionally Download the PDF from this view to pull the PDF out of ProQuest and into your local PDF reader or directly to your device. Abstract/Details: displays the citation, full abstract and indexing details. Any linking tools that the library administrator has enabled to help locate the full text will be available here. The Details section shows all available bibliographic information for the item. A permanent link to the item is also included for you to bookmark or include in your own documents. Clicking a linked term (such as subject or author) will retrieve other items indexed with that same term and take you to a new Search Results page. Please see the Searchable Fields page of this guide for a list of common ProQuest fields. References: if provided by the author and publisher, the list of References will be visible. If one of the References is available to your library through another ProQuest database, you will be able to click on the reference to view the full record. 2. When viewing a full record, use one of the tools to work with the item. The Download to PDF button appears when there is PDF full text available for the document. Clicking on this will download the PDF to your machine. If there is full text for a document but it is not available in PDF, this button will instead say Save as PDF. This will take the contents of the full text and save it in a PDF file for ease of use and storage. The Cite tool generates a bibliography. Copy and paste the generated bibliography into a document and make any necessary edits. Remember to always check for accuracy. You can also Email or Print any selected records. Add to selected items lets you select the record and create a list of items to work with later on. In addition to using these features from the Document view page, they can also be used from the Results page, Selected items list and through the Folder icon. 3. With some documents, you may additionally see Cited by link; this displays a list of other ProQuest documents that include the current document in their list of References. 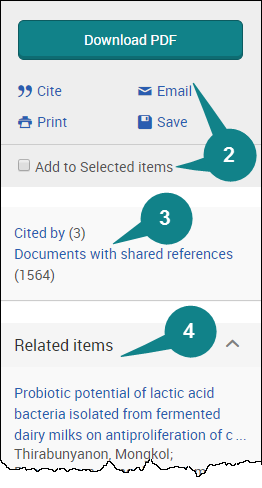 Documents with shared references provides a list of the ProQuest documents that have References in common with the current document. 4. The Related items menu displays five suggested items that are related to the current record. 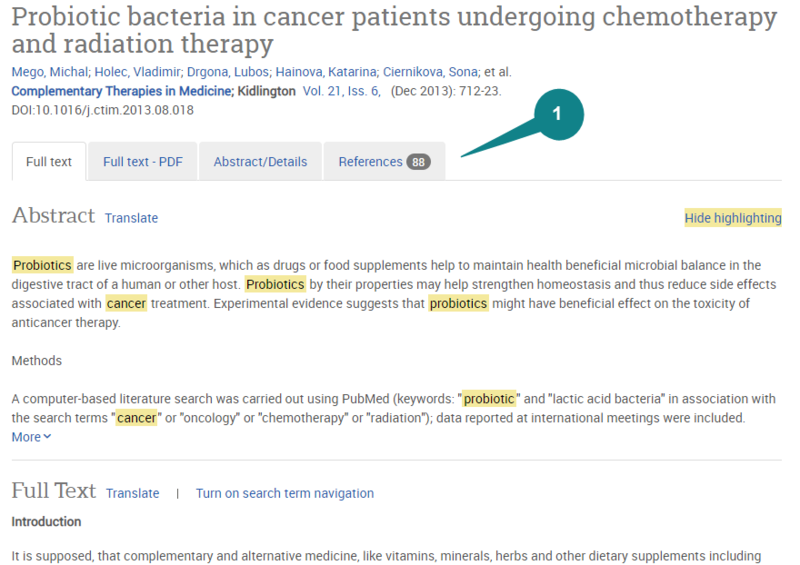 ProQuest analyzes the keywords in the full record and then suggests similar items that include similar key words, phrases, or concepts as the displayed document. Click on a title to display the document. Click the See more related items link to view more documents. 5. 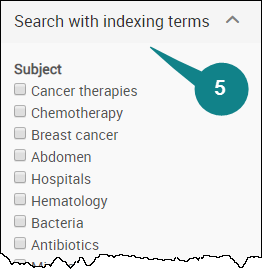 Search with indexing terms appear below the Related items and displays the indexed subject terms for the record and allows you to choose relevant subjects. When you click Search, ProQuest looks for documents in your currently selected databases that are indexed using ALL of your selected terms. It is possible to come across records that do not include subject terms and therefore this feature may not be available.